Broadley Vineyards is a family owned winery established over 30 years in the hills west of the town of Monroe, Oregon, producing distinguished wines since 1986. 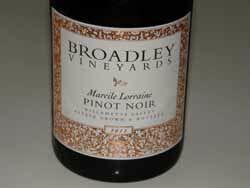 Technically, Broadley Vineyards is in the Willamette Valley, but lies on Highway 99 halfway between Corvallis and Eugene, outside of the more publicized sub-appellations of the Willamette Valley which are located in the northern Willamette Valley. 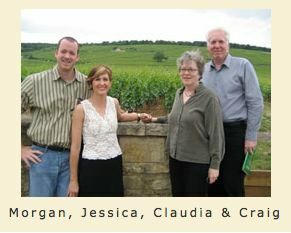 Craig and Claudia Broadley launched the winery in 1982, and are now joined by son Morgan, daughter-in-law Jessica, and two grandchildren Olivia and Savanna. 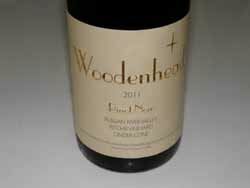 Like so many Oregon vintners, they were from California, and had developed a likening for Pinot Noir. 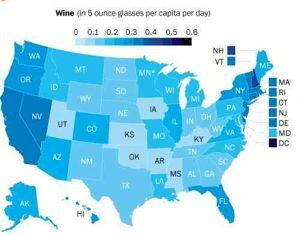 California vineyard land was too expensive, and Oregon seemed like the right place to grow Pinot Noir...cheaper. They found a unique site on a hillside in Monroe, established vines, and by 1994 had earned a reputation for ultrapremium estate Pinot Noir. 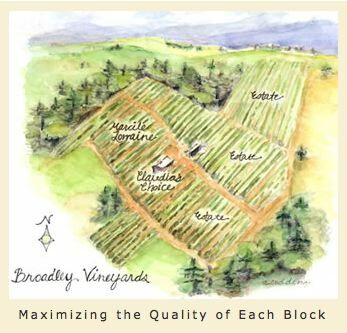 Broadley Vineyards is a relatively warm site known as the “banana belt” within a cool climate. The 30 planted acres offer many different exposures, elevations and soil types leading to different flavor characteristics in the wines from the different blocks. The grapevines are planted in an unusual eastern and northeastern aspect to protect the vines from storms that traditionally arrive from the Southwest, and to prevent over ripeness of fruit. Soils are volcanic with good drainage without excessive vigor. Another unique aspect of the vineyard is the use of the lyre trellis system, splitting the canopy into two walls of grapes. The planted clones are diverse. Pommard and Wädenswil were first planted in the early 1980s, but over time a number of Dijon clones were added. At the winery, Morgan Broadley’s winemaking is distinguished by partial whole cluster fermentation, significant fermentation in wood containers, and the absence of rigid fermentation temperature control. The wines are aged in new and one to two-year-old used French oak barrels and always unfined and unfiltered. The winery’s 2012 harvest report describes the growing season as dry and a nearly perfect harvest. The crop was small, but produced wines similar to those from the 2008 vintage in size and depth of flavor. 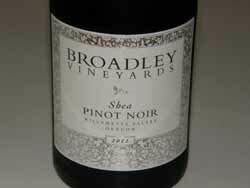 I have never visited Broadley Vineyards, but based on my tasting of the remarkable 2012 Pinot Noirs, I am going to make a beeline to the winery on my next Willamette Valley visit. The winery’s tasting room is open Thanksgiving weekend and a late April open house, otherwise by appointment at 265 S. 5th Street in Monroe. The website is www.broadleyvineyards.com. Beyond the wines sampled here, there is a 2012 Jessica Pinot Noir (clones 667 and 115 from a protected northeastern mid slope of the estate vineyard, $50), and a 2012 Claudia’s Choice Pinot Noir (from the oldest vines in the estate vineyard, $50). Rod Berglund, the proprietor and winemaker at Joseph Swan Vineyards in the Russian River Valley, always includes some informative and even provocative writing in his email newsletters. The Spring Newsletter spoke to the different Russian River Valley “Neighborhoods.” I would like to paraphrase his commentary since it is so enlightening. In recent years, there has been talk of defining the wines from the different sub regions of the Russian River Valley, and the Russian River Valley Winegrowers Association has started a conversation about defining the character of the various neighborhoods. Rod points out that the wines from each sub region carry an overall defining character of the Russian River Valley AVA as a whole, but seem to represent variations on the theme. The Pinot Noirs from the Middle Reach are generally riper, richer and more powerful fruit-driven wines, those from the Laguna Ridge are earthy, spicy and red-fruited, while those from the Green Valley have higher acidity and crisp, bright red fruit. The boundaries of the specific sub regions have not been clearly delineated, except Green Valley, which is its own appellation within the Russian River Valley. 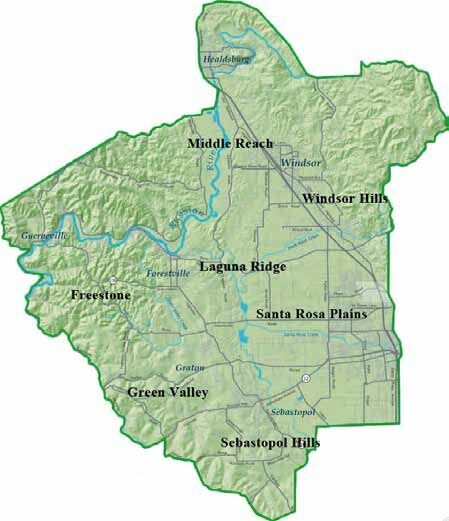 As many as seven sub regions have been identified, including Middle Reach, Windsor Hills, Laguna Ridge, Santa Rosa Plains, Sebastopol Hills, Green Valley and Freestone. The Russian River Valley AVA is defined by the coastal fog influence in varying degrees depending upon elevation and distance from the Pacific Ocean. Currently, a large panel of winemakers is being assembled who are skilled in tasting young, unfinished wines and discerning the attributes that are directly attributable to the characteristics of the fruit from which they were made. The information will be recorded into a searchable data base and will be tied to vineyard and harvest data. Over a period of many years, patterns should emerge that define the various neighborhoods or even lead to the discovery of more neighborhoods. Rod’s winery and estate vineyard lie in the Laguna Ridge area, a north-south ridge of low-lying hills west of the Laguna de Santa Rosa and the Santa Rosa Plains area. The Laguna Ridge tends to have earlier bud break, spring temperatures are higher, summer temperatures are often cooler than the valley floor, and the fog often hangs later as well. These differences manifest themselves in the wines made from the Laguna Ridge. The Pinot Noirs tend to have bright, deep red fruit, great acidity, usually some spice and earthy components, as well as the typical Russian River Valley lush mouthfeel. The wine from the Santa Rosa Plains, in contrast, seems to be prettier with brighter red fruit and less spice. The Green Valley wines tend to have more acidity and often more tannin. Rod emphasizes that these are generalities. 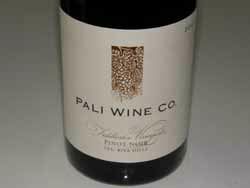 I have reviewed a number of Russian River Valley wines lately, some of which are from newer producers, and some represent inaugural releases (Della). The original California winemaking boom began not in Napa or Sonoma, but in San Francisco - SOMA, or South of Market, to be exact. At one time, no less than 120 wineries and commercial cellars called San Francisco home, but the 1906 earthquake ended many of the dreams of wine producers, and whatever spark remained was eliminated by Prohibition. Until now. Bluxome Street Winery is open “South of the Slot” in San Francisco as both a working winery and a place to relax and enjoy a drink or two. Before SOMA, the area was called “South of the Slot,” a term coined by Jack London referencing the iron fissure running along Market Street upon which the San Francisco cable cars traveled (and still do). Bluxome Street Winery produces Pinot Noir, Sauvignon Blanc and Chardonnay from Russian River Valley vineyards. The wines are sold by the flight, glass, bottle or barrel. The winery, at 53 Bluxome Street, welcomes visitors from noon until 7:00 PM Tuesday through Sunday. 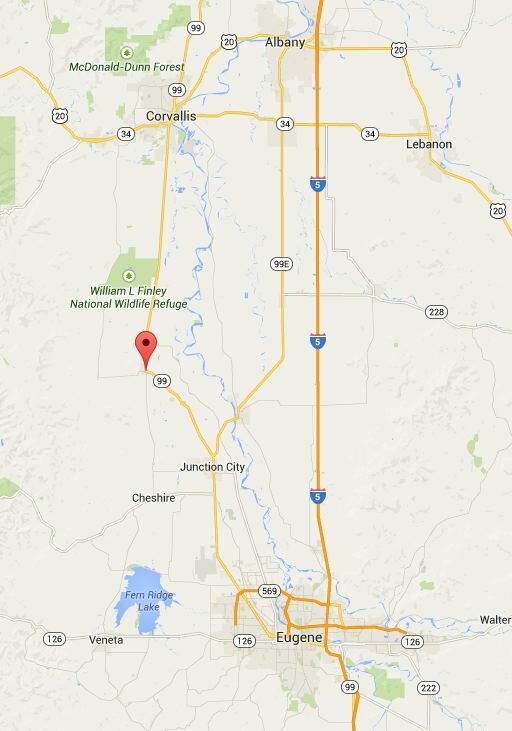 Gracianna Winery is located in the Middle Reach of the Russian River Valley. 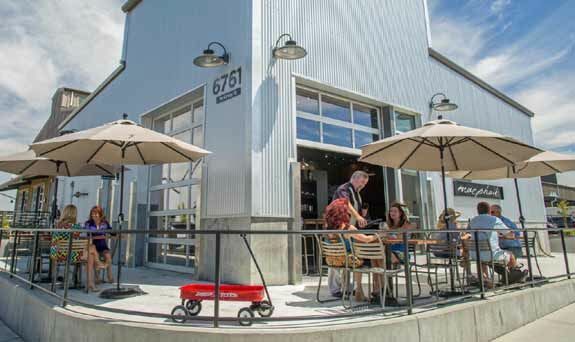 It!s Mercedes Riverblock Vineyard, named after a family matriarch, grandmother Mercedes Sordia, is located on the “Miracle Mile” of Westside Road in Healdsburg. The winery was founded in 2005 by the Amador family of Sonoma County who have been farming and ranching for generations. The name of the winery comes from the matriarch of the family, their French Basque great-great-grandmother, Gracianna Lasaga. A book about her life titled Gracianna was published by Trini Amador in 2013. The 2012 Estate Pinot Noir is the inaugural release from the Mercedes Riverblock Vineyard. The release coincides with the completion of the Gracianna family estate home, a John Pfleuger design that is inspired by the architecture of the Renaissance and the Tuscany region of Italy. 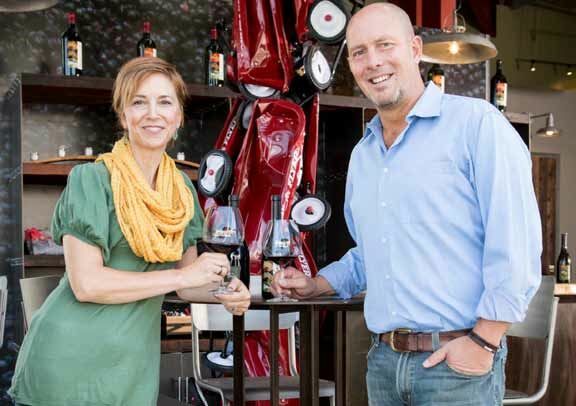 Gracianna's owners, Trini and Lisi Amador, have built a tasting room and special spaces for entertaining on the winery grounds as well. The tasting room, located at 6914 Westside Road, is open daily except Wednesday from 11:00 to 5:00. The website is www.gracianna.com. Gracianna has medaled in every wine competition entered over the past five years since their first entry in 2007. 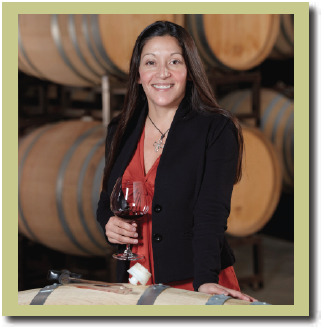 The winemaker is Trini Amador. I wrote recently about the experimental work Andrew Beckham is doing using upwards of thirty-five different terra cotta vessels of varying size and shape from egg to round, as well as variable firing of the pottery to vinify and age wines. It is a natural extension of his expertise as a potter and his winemaking skills. 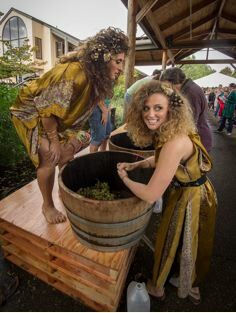 The vinification of wine in amphorae dates back to ancient times, but has engaged the curiosity of both Old and New World vintners over the last two decades. It is well known that the traditional oak barrel imparts tastes and tannins to wine. Amphorae are thought to be rather inert, but wines raised in these vessels are definitely different and may exhibit more “minerality” among other qualities. Considerable trial and error looms ahead for those interested in this new approach to discover whether this is a novelty or has real benefits. 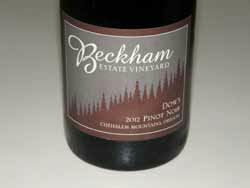 When I visited Beckham Estate most recently and tasted with Annedria Beckham, I briefly sampled the 2013 AD Beckham Pinot Noir and the 2013 AD Beckham Pinot Gris. 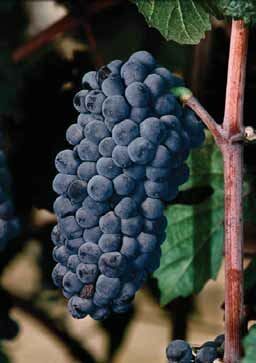 The Pinot Noir was a barrel sample made with purchased fruit (1 barrel total production). Clones 777 and 115 were cold soaked and fermented in an amphora for 21 days, then pressed to neutral oak. The wine will be bottled in September unfined and unfiltered. The Pinot Gris, also 1 barrel, spent 30 days in an amphora on the stems and then aged in second fill acacia barrel. The wines are definitely unique. 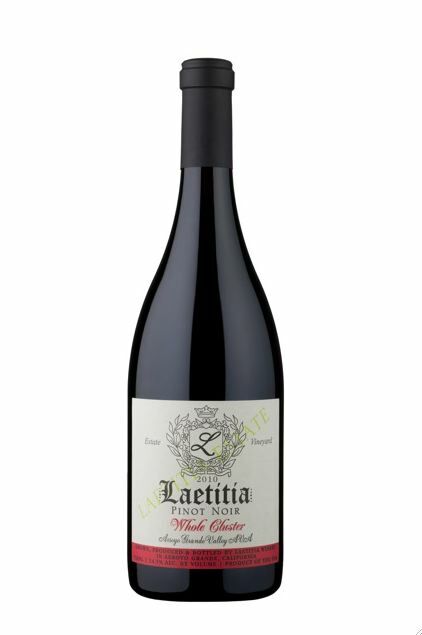 The Pinot Noir was highly aromatic with bright scents of fresh, juicy cherries, baking spices and sandalwood. With swirling there was a hint of clay or terra cotta. On the palate, the wine displayed light to mid weight cherry, raspberry and pomegranate flavors backed by fine grain tannins and zippy acidity. There was a slight earthy, gamey undertone and a slightly tart finish. 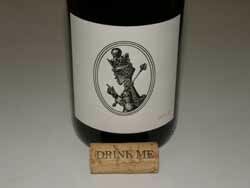 The Pinot Gris was light pink in color with aromas of cherry and strawberry and baking spices. 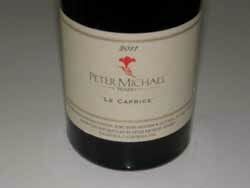 The palate offered more white stone fruits, floral notes, and an iron minerality. The finish was tart with electric acidity. The AD Beckham amphorae wines will be offered first to the winery!s Wine Club members. 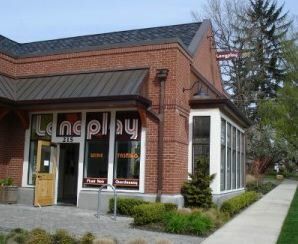 I recently visited Todd Hansen, proprietor and grower of Longplay Wine, at his quaint Newberg, Oregon tasting room. Todd developed an interest in wine while serving in the American diplomatic corps in France, Chile and South Africa. In 2005, Todd bought the 54-acre Lia’s Vineyard (re-named after his daughter Lia) that had formerly been part of Rex Hill’s Jacob-Hart Vineyard. Rex Hill changed ownership and parts of the Jacob-Hart Vineyard in the Chehalem Mountains was sold to Todd and Olenik Vineyards, with Rex Hill retaining ownership of some of the vineyard. Neighboring vineyards include J. Christopher’s Appassionata Vineyard and Adelsheim’s Quarter Mile Lane Vineyard. The vineyard is about four miles northwest of Newberg. Lia’s Vineyard plantings originally date to 1990, with subsequent plantings in 1993, 1999-2002 and 2009. The dry-farmed vines include 25 acres of Pinot Noir (eight clones of Pinot Noir: 114,115, 667, 777, “828,” Pommard, Wädenswil and Mariafeld), and a little over 2 acres of Wente clone Chardonnay. The original (1990 & 1993) Pommard, Wädenswil and Wente Chardonnay are own-rooted and subsequent plantings of these clones and selections were propagated from own-rooted cuttings. Soils are primarily Jory with a transition to sedimentary around the 400 foot contour. Elevation ranges from 380 to 560 feet. Longplay is a three-man operation, with Todd doing the marketing, sales, compliance and farming, Javier Marin, owner of JM Vinegrower LLC, (the long time ex vineyard manager at Shea Vineyard) managing the vineyard, and winemaker Jay Somers of J. Christopher wines crafting the Longplay wines at his facility across the street from Lia’s Vineyard. Aron Hess was the winemaker from the inaugural vintage in 2007 until 2010, replaced by Jay Somers with the 2011 vintage. 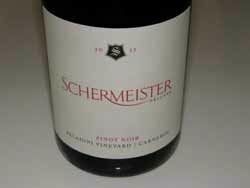 Somers shepherds the Longplay wines with Todd’s decision making input, and as such, Longplay wines are distinct from J. Christopher wines. All Longplay wines are estate grown. 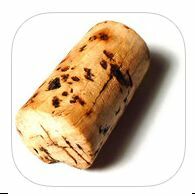 Commercial yeasts are avoided with Pinot Noir but used with Chardonnay, and there are no additives used. Sugar and acid adjustments are employed when necessary. 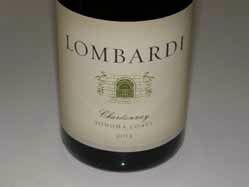 Chardonnay is fermented in neutral oak barrels and Pinot Noir in 25% or less, usually 15%, new French oak barrels. 80% of the estate vineyard fruit is sold to other vintners, including White Rose Estate, Seven of Hearts, J. Christopher and Patricia Green. 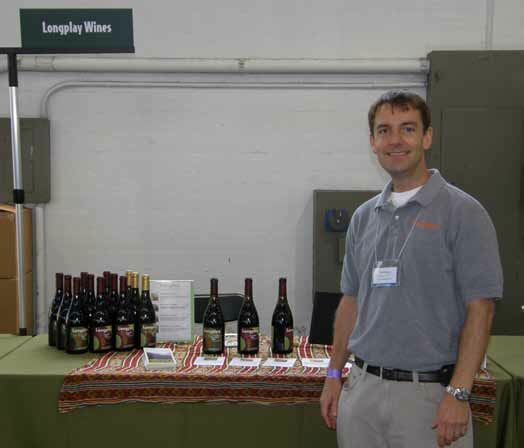 Todd staffs the Longplay Tasting Room himself Fridays, Saturdays and Sundays from 11:00 to 5:00. Other days and times can be arranged by appointment. 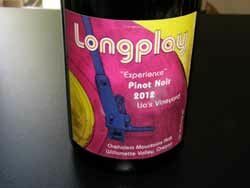 Special openings and events are listed on the website at www.longplaywine.com. 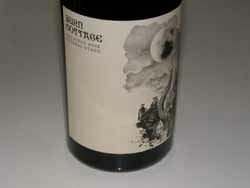 The wines can also be acquired online through the winery’s website store. I tasted a number of Longplay wines with Todd from the 2011 and 2012 vintages, two markedly different growing seasons that resulted in contrasting wines. 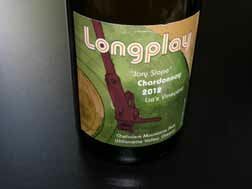 The Longplay wines are quintessential Willamette Valley in character, with modest alcohols and extraction, bright acidities, and subtle nuances. The winemaking at least gives the vineyard a chance to express itself. 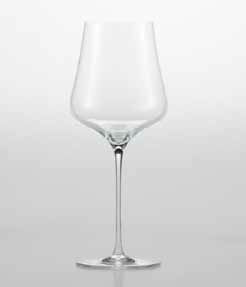 The wines are modestly priced and are particularly suitable for accompanying food. The 2012 wines will be released in early 2015. DeVillaine went on to point out, “New Zealand is a very young country, the wine industry is very young, but with this idea of making wines of terroir which took in the minds of many vignerons in New Zealand, things will go much more quickly than they did in Burgundy.” He was impressed by the progress New Zealand has made, commenting, “There are today a lot of good wines, certainly more than a few years ago. Great progress has been made, but my general impression is that besides these good wines, there are only a few great wines.” Perhaps the remarkable 2013 vintage will be able to deliver more great wines. 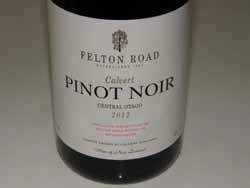 Periodically, I dip into New Zealand Pinot Noir to sample wines from prominent producers. Here are my latest reviews.